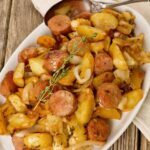 Simple roasted potatoes get a lot of extra flavor from a link of andouille sausage in this easy side dish recipe. 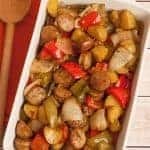 Andouille is a spicy, smoked pork sausage commonly used in Cajun dishes like gumbo and jambalaya. 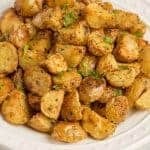 For this recipe, we browned the sausage and coated our potatoes in a little of the rendered fat combined with olive oil, then roasted them in the oven and topped the dish with some minced scallions. 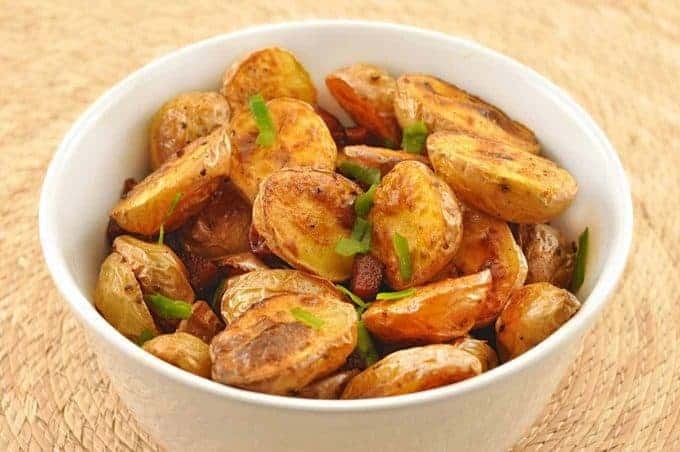 An easy-to-make side dish of roasted potatoes flavored with spicy, smoky andouille sausage. Heat a heavy, oven-proof skillet over medium-high heat and add the sausage. Sauté until lightly browned and some of the fat has been rendered. 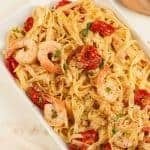 Drain on paper towels and discard all but 1 tablespoon of the rendered fat. Add the olive oil to the pan along with the potatoes and sauté for 3 to 4 minutes. Season with the smoked paprika, salt and a few grinds of black pepper. 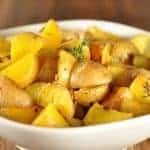 Place the pan in the oven and roast until the potatoes are golden brown and tender, 12 to 15 minutes, turning the potatoes once about midway through. 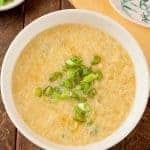 Top with the minced scallion and serve immediately.